Recently, a trend to be on the lookout for is vintage and retro style imagery. Have you ever been surprised by the amazing photo effects in those pictures? Those wonderful days in which you could use film development techniques to create brilliant photos are not coming back. Do you miss them? Now you can add film effects to your digital photos with the help of ArcSoft PhotoStudio, smart picture editing software, or add film effects to photos on Mac with ArcSoft PhotoStudio 6 for Mac. Follow along to start your own digital darkroom service for your photos. 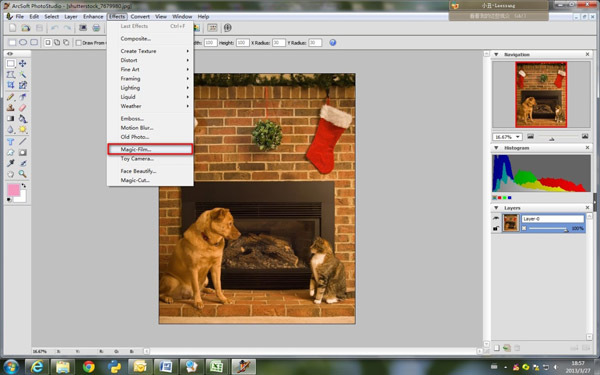 Use the "File"-> "Open" command to access a photo you want to apply the Magic-Film effect to. Your photo will be shown in the center of editing area. Navigate to "Effects" -> "Magic-Film". 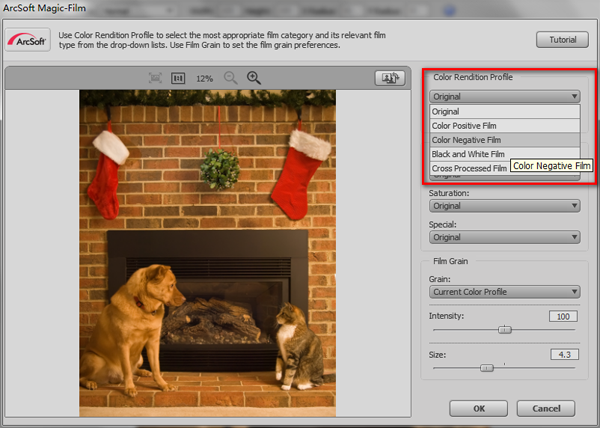 Use the pop-up a window to choose from the available film effects. You can use Color Rendition Profile to select the most appropriate film category and its relevant film type in the drop-down list. For Color Modes, you can adjust Contrast, Saturation, and Special color effects there. Below the color profile and color modes, you're able to apply a different film grain with flexible intensity and size adjustment. The best way is to zoom in to the photo (the software will fit the full image in the preview window by default) before you choose a grain.That will let you focus on the details and get a better idea of the final result. Use the two magnifier-shaped buttons to zoom in and zoom out. You can refer to the tutorials on the top-right for more details on this step. All these film effects are included in the ArcSoft PhotoStudio for Mac. If you are a Mac user, Enjoy different film effects with your photos after the Mac version being installed. The applying process of Magic-Film is similar.